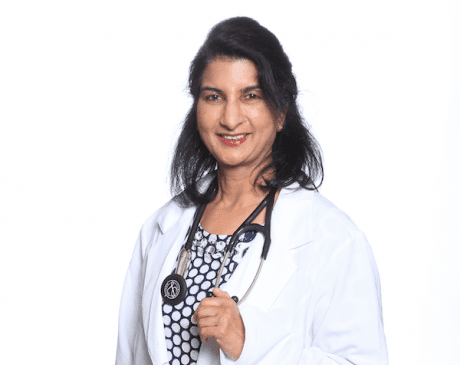 Tamirisa Renu, MD, who has been practicing Internal Medicine for the last 30 years, is one of the area’s most trusted physicians in her field. Dr. Renu, as the founder of Sugar Land Medical & Aesthetics, has strived to expand and bring cutting edge technologies to improve patient care in a holistic fashion. Dr. Renu is a strong advocate for preventative care. In addition to preventative care, she specializes in the diagnosis and treatment of a wide variety of serious chronic medical conditions. Patients trust her compassion and expertise in the treatment of such conditions as diabetes, hypertension, cancer and cardiovascular screening and prevention. She believes in building patients’ confidence and well-being through inner balance with hormone therapy and micronutrient support. In the realm of aesthetics, she looks to restore youthfulness and vigor with a multifaceted approach. Whether you’re seeking guidance for your wellness or quality specialized care, Dr. Tamirisa Renu is a top choice in Sugar Land, Texas and the surrounding area.